When I was a teenager, I was prescribed eye glasses for reading but I foolishly didn’t wear them as recommended because of my young vanity. I also didn’t protect my eyes properly when I was out in the harsh Florida sun on all of those outdoor activities. Therefore, at age 41 my eyesight is worse than ever and I have to wear prescription eyeglasses constantly in order to see properly. My vision is so very important so I am now doing everything necessary to protect my eyes from further deterioration. In honor of Healthy Vision Month, I am excited to introduce you to two new products that I have been using for my own eye health. I am taking a daily supplement called EyePromise vizual EDGE vitamins and cooking a variety of delicious recipes that are packed with nutrients to support eye heath in the Visionary Kitchen Cookbook. EyePromise vizual EDGE vitamins is formulated with targeted ingredients that may over a period of time help with “visual processing speed, contrast and color saturation and reduced glare and light sensitivity.” I have a terrible problem personally with glare and light sensitivity and so does my husband who has baby blue eye color and his light sensitivity is even worse. We have decided that we will both be taking this vitamin supplement on a daily basis in an effort to prevent further problems with our vision. How can EyePromise vizual EDGE vitamins help support eye health? It contains Zeaxanthin which is a very important nutrient for eye health but I discovered that it is scare in many diets. In fact, I learned that in order to intake the recommended amount of Zeaxanthin I would have to eat 20 ears of corn (I love corn but that is a bit excessive). It also contains vitamins A, C, D3, E, B6, folic acid, B12, Manganese, Selenium, fish oil, lutein, CoQ10 and more. I also appreciate that this product is NSF® certified too. I have not been taking this supplement long enough to let you know if I am seeing improvement in my eye health but I am committed to taking it on a daily basis. I like that a daily serving is just one small softgel which makes it easy to remember to take every morning. My mother is going to have cataract surgery in June and I have suggested to her that ask her physician whether she should also start taking EyePromise vizual EDGE vitamins. 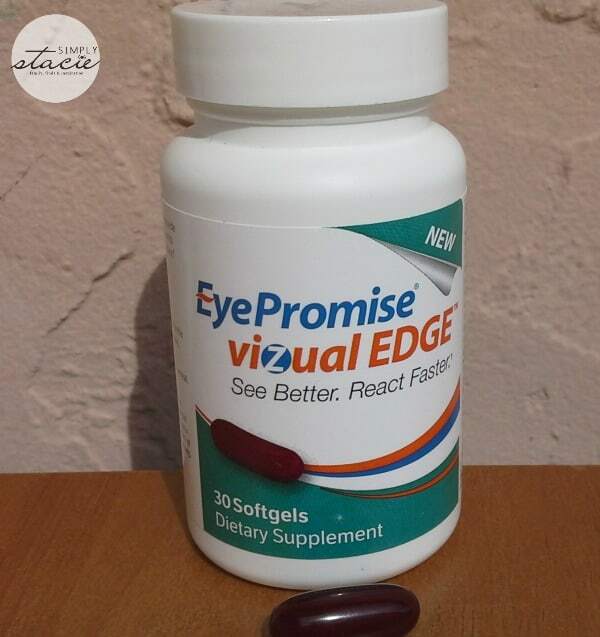 EyePromise vizual EDGE vitamins are available for purchase for $34.95 per bottle with free shipping or you can save by using the quarterly autoship method. I also noticed that by visiting the EyePromise website you may be able to save $5 off your first order of EyePromise visual EDGE vitamins! 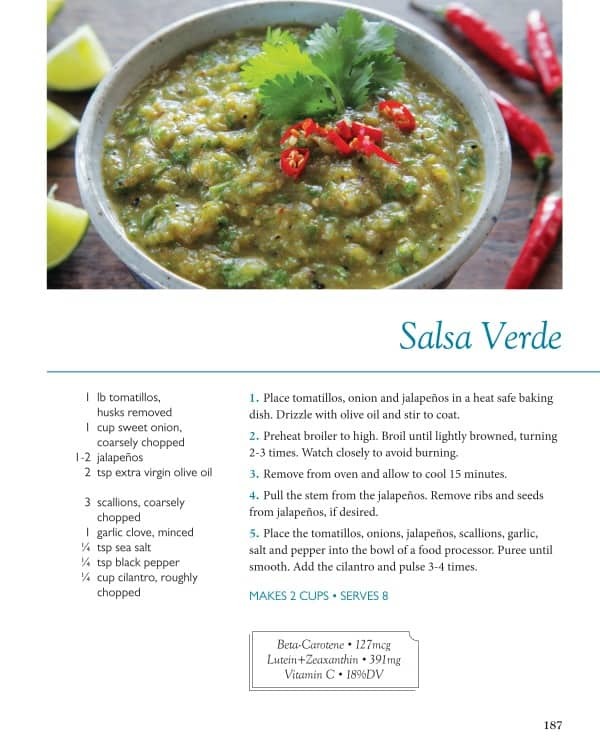 I am also making a ton of delicious recipes for my entire family from the Visionary Kitchen-A Cookbook For Eye Health (SRP $25.95) which was written by Sandra Young, OD and features beautiful photographs by Anne Marie Coutts, DTR. Packed with over 150 healthy recipes that are filled with essential nutrients that support eye health such as lutein and zeaxanthin, this cookbook has tons of great ideas. I like that many of the recipes are low-glycemic so I can eat this on my current eating plan and there are also gluten-free, vegan, vegetarian and dairy free options. Our organic vegetable garden is full of delicious bounty and I love trying new recipes from the Visionary Kitchen using our fresh vegetables such as the Kale & Farro Beef Stew which was a big hit with my entire family….it was so hearty and delicious! Other favorites include the Indian Yogurt Marinade which was delicious with chicken, Curried Cauliflower and the German Cabbage & Apple Slaw (my husband raves about this recipe). My children love the Chia Berry Popsicles and the Apricot & Goji Energy Bites. This morning for breakfast, I enjoyed a delicious Matcha Coconut Smoothie which included fresh lettuce from our garden (who knew lettuce would taste great in a smoothie) and satisfying protein. These are just a few of the recipes that I am excited to try in the Visionary Kitchen-A Cookbook For Eye Health. Normally I select a few recipes that interest me in a new cookbook but this one is exceptional because there are tons of recipes that would be appealing to my family! You are invited to visit Visionary Kitchen to learn more and purchase this cookbook……protect your eye health while enjoying delicious, healthy recipes!